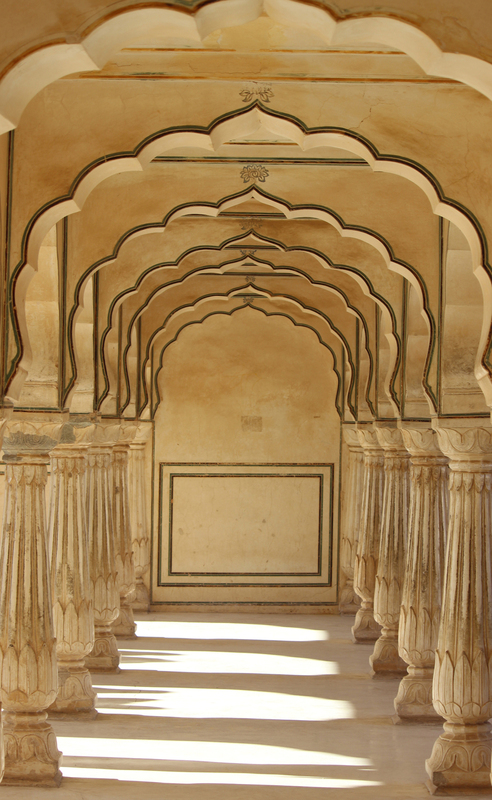 The Amber Fort in Jaipur, India. Outside the fort hawkers were relentless, shoving carvings of Ganesh, “hand-painted” silks, and turbans into our hands while we waited in line for an elephant to ride up the steep ramp to the fort itself. Some people in line got extremely upset and yelled at the hawkers who only pushed harder. Others just treated it like a challenge. Even agreeing to purchase from them didn’t stop the onslaught. Even once we mounted our beautiful, regal pachyderm the hawkers stood beneath us holding treasures aloft so we could throw money down at them for their wares. At a certain point they were no longer allowed. We were now free to turn our attentions to the beautiful structure and strike up a conversation with our own personal mahout (elelphant rider). We were delivered to a huge courtyard where waiting for us were more hawkers. These were much easier to get through. And once we did. This. This was our reward. I’d do it again. Fimd more beautiful arches by others here. It was a pretty cool experience and the fort was beautiful. Thanks for the comment.